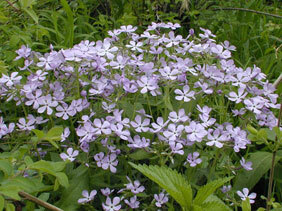 Also Called: Blue wood phlox, sweet-william phlox. Stems: Erect, ascending, or decumbent; sterile shoots sprawling at base of plant, fertile shoots erect or ascending. Leaves: Opposite, simple; those of sterile shoots elliptic, blunt-tipped; those of fertile shoots lanceolate to narrowly oblong, 1 to 2 inches long, 1/2 to 1 inch wide, nearly glabrous or sparsely hairy; margins entire; tips usually tapering to points. Inflorescences: Clusters of 9-30 flowers, terminal. Flowers: On short, pubescent stalks; calyces 5-lobed, glandular-pubescent, lobes long tapering, awl-shaped; corollas bluish violet to pale purple, lighter in the throat, 5-lobed; lobes 1/2 to 3/4 inch long, blunt-tipped; stamens 5, unequal. Fruits: Capsules, egg-shaped; seeds few. Habitat: Moist, open woods and thickets. Distribution: Principally east 1/3 of Kansas. Comments: This colony-forming plant requires partial shade.